Organic Gardening Magazine features the Outlaw Garden again! Some mornings start with a really nice surprise. This morning was one of them. I always start my days with a cup or two of coffee, and a quick stroll around the internet. 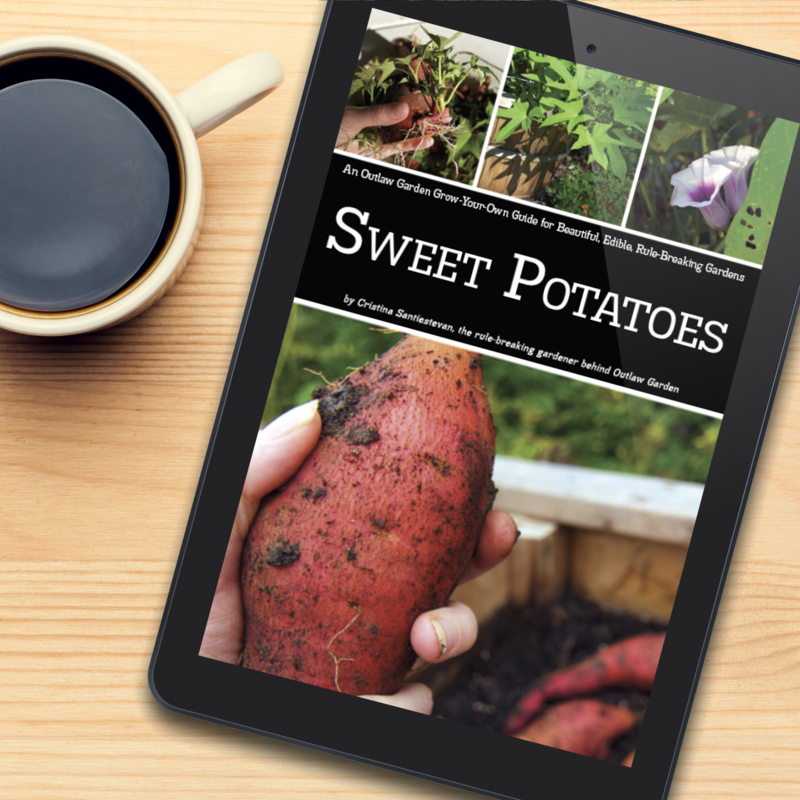 Today, I clicked over to Organic Gardening Magazine’s website. I was thinking about fall crops, and wondering about starting some beets and chard. But, I got distracted. 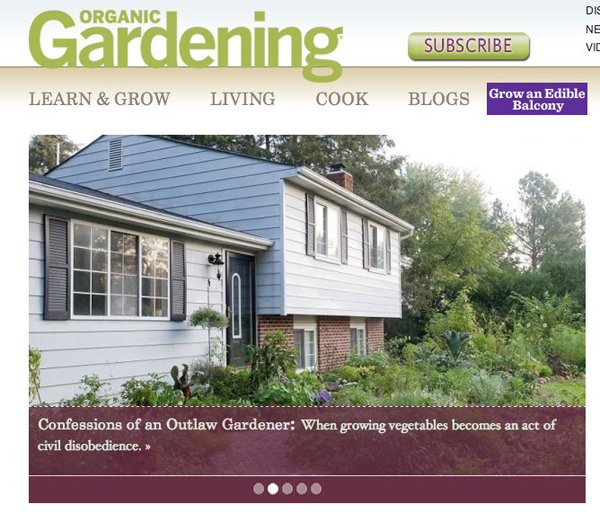 Because, right there, smack in the middle of the homepage, was a photo of my home and garden! Here’s a secret for you: I’m still not at all used to the fact that my home garden has become so public. Don’t get me wrong. I LOVE sharing it with all of you. And, not just because this is fun; it’s also important. I am absolutely committed to the idea of growing vegetable gardens rather than grass, even in the front yard, even if it means we need to bend the rules a bit (and, long-term, I’m determined to change those rules). But, it’s still a little strange. I’ve had folks I’ve never met ask me about my tomatoes, and one of my favorite growers at my local farmers’ market recognized me from a photo in Organic Gardening. I’m more wallflower than ringleader. When I did theater in college, I was a stage manager. Never an actor. So, if I seem surprised by the attention my garden and I are receiving, it’s because I am. But, I’m also loving the attention. Not because I’ve suddenly discovered a desire for the spotlight. But, because all this attention means that so many of us — you, for starters — are also invested in this idea of growing vegetables wherever the sun shines and the ground is fertile. This is a conversation that needs to happen. People are sowing vegetable gardens in incredible numbers these days. Some of us grow vegetables because money is tight and we need to eat. Others of us are fed up with the never-ending chemical assault on our food supply. And, many of us are motivated by nothing more than a desire to sink our hands into the dirt, feel the sunshine on our backs and literally taste the fruits of our own labors. Whatever our individual reasons, we gardeners are planting more and larger vegetable gardens every year. And some of these gardens — like mine — sit proud and visible in our front yards. Some of us have no rules dictating our landscaping, and can grow our tomatoes wherever we like. But, many of us are restricted by HOA covenants or local zoning code. For many homeowners — myself included — the rules clearly forbid vegetable gardens in the front yard. I understand the premise of these rules. Really, I do. I think most gardeners do. HOAs, towns and cities want their neighborhoods and communities to look nice. And, so do I. Every homeowner knows their property value is affected by the appearance of their neighbors’ homes and yards. So, I get it. But, I don’t think it should be about vegetables and not-vegetables. That’s a false comparison. We shouldn’t be pitting vegetable gardens against ornamental gardens. Some of the prettiest plants out there are vegetables (have you ever seen okra in bloom?). And, frankly, I think some of the most popular ornamental plants are just boring. So, no, I don’t think it’s about vegetables and not-vegetables. I think it’s about beauty and respect and maintaining a yard that makes your house — and, yes, your neighbors’ houses — look good. I’ve written about this before, and I’ll write about it again. We can break the rules. In fact, as long as the rules discriminate against vegetables, I think we should break the rules (whenever we’re comfortable with the risk, that is). But, we can break the rules and be respectful about it, too. And, that’s my long ramble about why we should be talking about vegetables, and their place in our front yards, back yards, balconies or wherever. I’ll probably continue to be a little surprised whenever someone new asks me about my rule-breaking tomatoes. But, I’ll also be thrilled. Because, folks, if we want to change those rules, we’ve got to push against them. We’ve got to talk about them. And, we’ve got to win over the doubters by sharing our front-yard-grown tomatoes and squash and green beans with them. If you’re new here, I hope you’ll take a moment to explore the rest of the website. And, if you haven’t read the profile in Organic Gardening Magazine yet, you can click here to read the full article online: Confessions of an Outlaw Gardener. Finally, if you’ve got a moment, please share your thoughts on growing vegetables in the front yard (or, wherever). I’d love to hear from you! Thank you, and happy gardening! Congrats on the great garden, sticking it to the hoa & the great website! As for those sweets, if you bought them from a nursery and they had very purple or lime green foliage, chances are good they were an ornamental variety. Edible, but not exactly tasty. The edible varieties are a bit less showy (though, in my opinion, still quite lovely), and are generally only available via mail order or by starting your own slips in the late winter / early spring. I confess that as my husband and I have been looking for houses, we have avoided all that have an HOA – even if it is a good deal – due to the sole reason that I desperately want a veggie garden. I agree with you on the prohibition of veggies in the front yard. It is foolish to prevent people from growing food. If you hop over to my fledgling blog you’ll see that I am a total advocate of eating veggies. So banning people from growing them does not contribute to their health. Boo to the HOA – however now I may be so bold as to get a home in one of those neighborhoods and just hid the veggies. Thanks for the comment, Rachel! It’s a tricky thing, these HOAs. Some are managed by good groups of volunteers, who work to maintain a nice community with usable common spaces for the residents. Others seem to be all about enforcing silly rules. Mine, luckily, is very chill. Still, no matter the intentions of the HOA, I think discrimination of vegetables is just insane. It’s incredibly common, and extremely unfortunate. Given enough time and awareness, we just may be able to change that. That’s my hope, at least! Thank you Outlaw Gardener. My husband and I enjoyed reading your article. We are seriously considering turning our front yard into a vegetable garden this year and are looking for ideas. That is how we came upon your website! We plan on keeping it simple the first year and adding to it year-to-year. We presently have a small garden behind the garage but because of the lack of sunshine from the surrounding trees (that we are reluctant to cut down), we need more sunshine which the front yard provides! Hence, the front yard garden… Keep breaking the rules and enjoy your garden this summer.